First of all, many of the main characters are voiced by the same man, Billy West. He does the voices of Fry, Dr. Zoidberg, Professor Farnsworth and many other secondary characters. While that's fairly common in animated shows, what is unusual is that he will do all the voices all in one take instead of multiple takes. West is often voicing three or even four different characters in the same scene, all in one take, switching back and forth flawlessly! 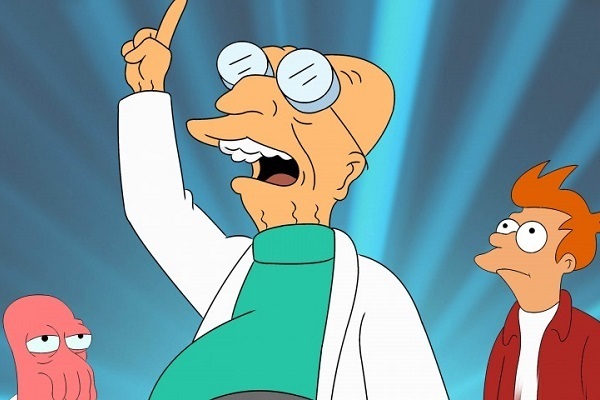 Cubert Farnsworth, Professor Farnsworth's clone child, was always a planned character for the series, even though he wasn't introduced until the second season. In his first appearance, he essentially played an animated version of the fans who point out plot holes and other inconsistencies, which are rampant in the show. It didn't quite work out how the writers and producers planned, so they just turned his character into more of a normal boy after that. 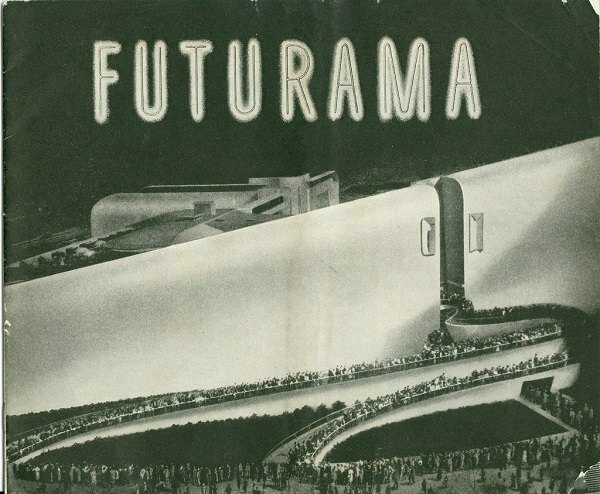 Futurama was named after the exhibit of the same name at the 1939 World's Fair. Suprisingly, that wasn't the first name considered for the show. Earlier choices for a title were "Doomsville" and "Aloha, Mars!" While you might know that Professor Farnsworth was named after Philo Farnsworth who was an inventor at the 1939 World's Fair for which the show is named, you probably don't know how the other characters got their names. Philip Fry was named after the late Phil Hartman who was set to play Zapp Branagan until he passed. Bender was named after John Bender from The Breakfast Club. Perhaps the most obscure naming was Turanga Leela who was named after French composer Olivier Messiaen's 1948 TurangalÃ®la-Symphonie. 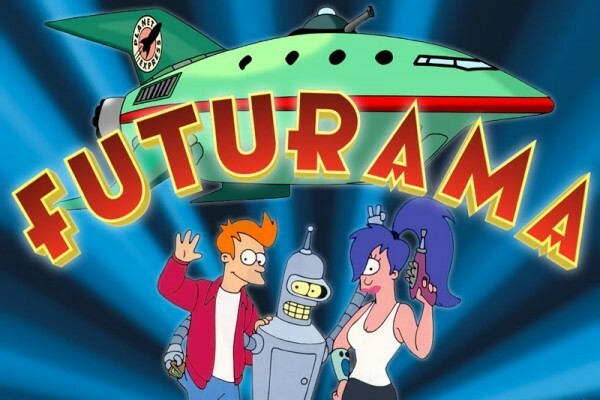 It looks like the creators of Futurama took the term foreshadowing a little too literally. At least two times they have inserted shadows of characters yet to be introduced into scenes way before we ever saw them in reality. 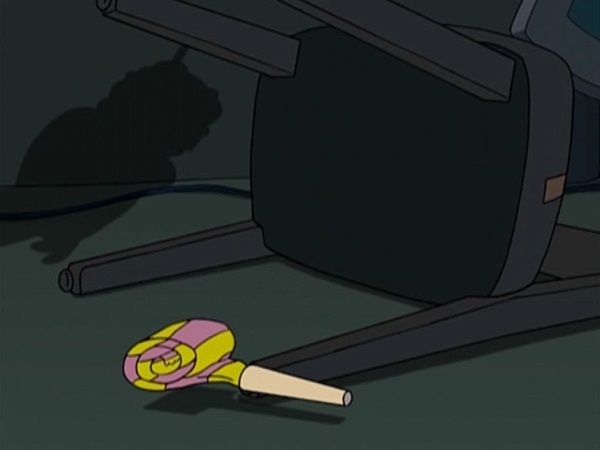 In the very first episode, you can see a shadow of Nibbler under the desk when Fry falls into the freezer even though Nibbler doesn't show up for several more episodes. And later, we see Leela's parents in the background of a sewer scene a full two seasons before we meet them! Everyone's probably wondered how Matt Groening came up with the idea for Futurama. The answer is that he came up with the idea while listening to a song called Robot Blues by a 60s psychadelic Scottish folk band called The Incredible String Band. 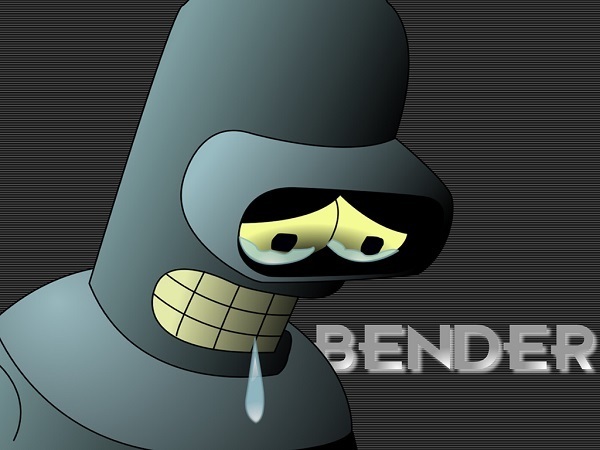 If you go read the lyrics, you can practically hear Bender singing them! 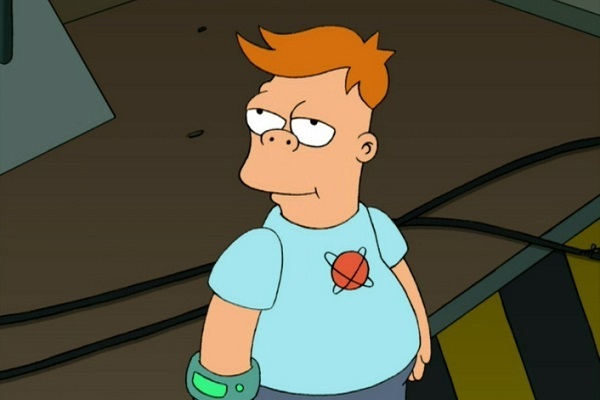 While it might seem like Fry and Leela's outfits are plain and randomly chosen, they aren't. 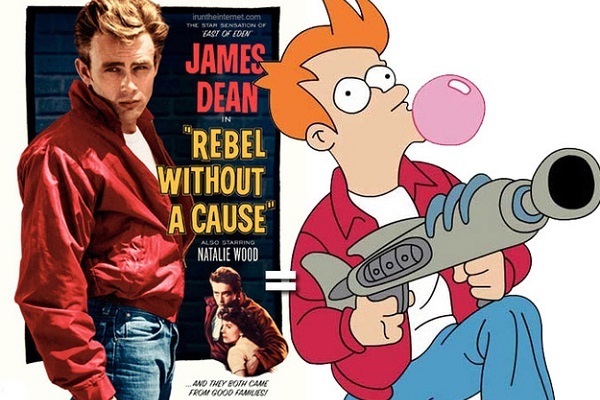 Leela's plain white tank top is supposed to look like Ripley's from Alien, and Fry's red jacket is modeled after James Dean's in Rebel without a Cause. 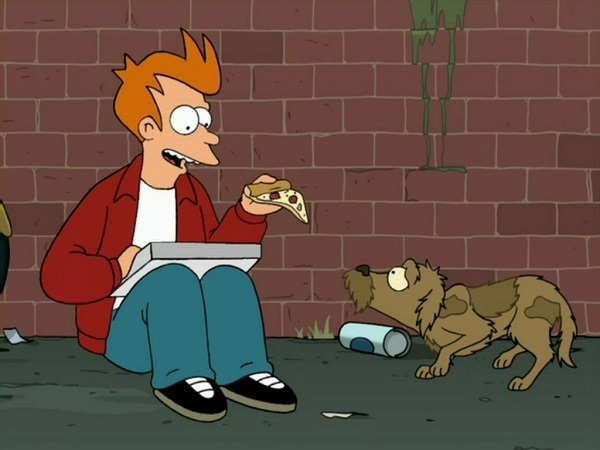 Fry's loyal dog Seymour, who waited around for his owner to return after he disappeared into the freezer and died outside the pizza place was actually loosely based on a true story. There was a dog named Hachiko who waited for 9 years for his owner to return after his death. 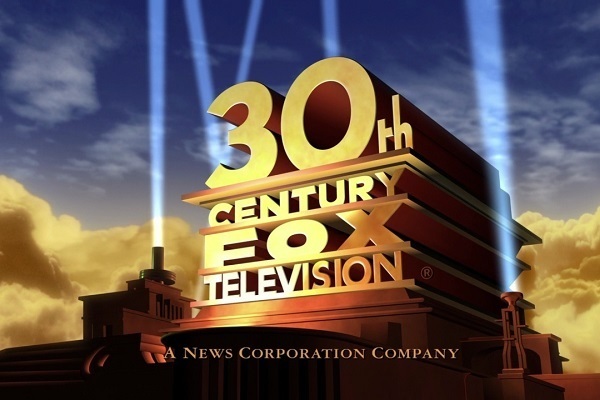 You know that hilarious image of 30th Century Fox that airs at the end of every episode? Well, it almost wasn't there. Fox actually was entirely opposed to the idea of it and only allowed it after Matt Groening bought the rights to it. There is a full length episode, 22 minutes long, consisting of just the Hypnotoad. At the end you will hear a voice that says "the audience will wake up remembering nothing and feeling refreshed." 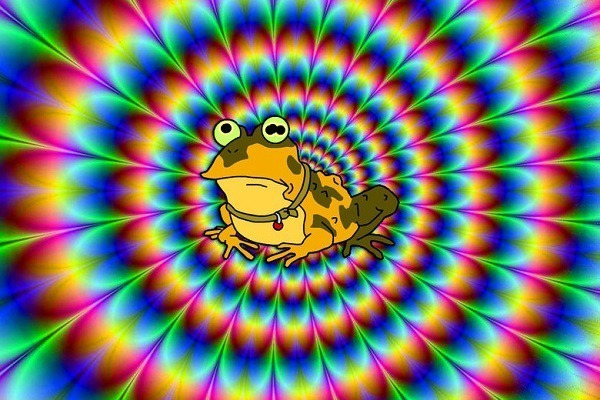 The hypnotoad is extremely popular, even with people who aren't fans of the show and is one of Matt Groening's favorite characters as well. Sorry, couldn’t find the hypnotoad episode. Due to a sudden inexplicable feeling of refreshedness, I looked for the the Robot Blues instead. Hermes Conrad is Jamaican. Facts! Was hoping for the hypnotoad, but I’ll allow it.